Dimensions 0.75 by 7.25 by 9.50 in. 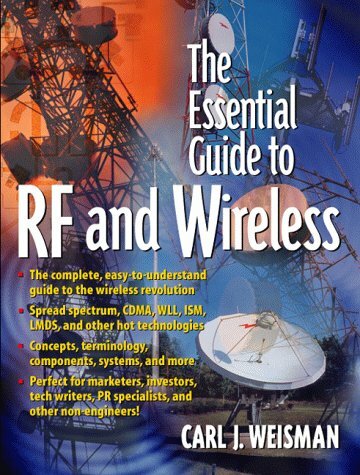 Amazon.com description: Product Description: Provides a complete, easy-to-understand guide to the wireless revolution including concepts, terminology, components, systems on spread spectrum, CDMA, WLL, ISM, LMDS, and other hot technologies. Designed primarily for marketers, investors, tech writers, PR specialists, and other non-engineers. Softcover. DLC: Radio--Equipment and supplies. About: Covers wireless concepts, terminology, and foundations, discussing such topics as spread spectrum and CDMA, broadband fixed wireless, mobile telephony, and wireless home networking. About: Provides a complete, easy-to-understand guide to the wireless revolution including concepts, terminology, components, systems on spread spectrum, CDMA, WLL, ISM, LMDS, and other hot technologies.